The TS 420 is so popular, it could possibly be called "the standard" to which other cut-off machines are compared. Users like it because it is compact, lightweight, reliable and proves itself day in and day out, all day long. The TS 420 features all the high-performance features of the TS 410 - including an X2 air filtration system for a clean and smooth-running engine and virtually maintenance-free filters. 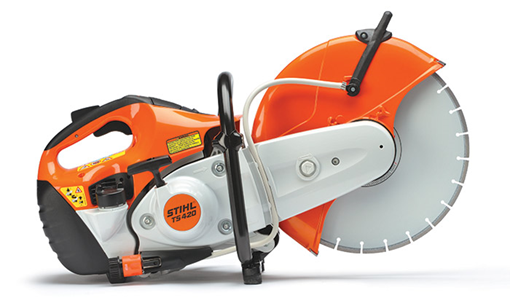 With the added benefit of a 14" cutting wheel, it will handle cuts up to 4.9 inches in depth. This cut-off machine backs up its larger cutting capacity with a ton of usability features.